Fully immunised for their age OR On a vaccine catch-up program OR Unable to be fully immunised for medical reasons. ‘Conscientious Objection’ is not an exemption under the ’No Jab, No Play’ legislation. For more information, view the immunisation schedule for vaccines available under the National Immunisation Program and when they should be received. Scientific evidence supporting vaccination is overwhelming, and the benefits far outweigh the very small risks. All vaccines currently available in Australia must pass stringent safety testing before being approved for use by the Therapeutic Goods Administration (TGA), Australia’s regulatory authority for therapeutic goods. Safety testing is required by law and is usually done over many years during the vaccine’s development. Once vaccines are in use, their safety is continually monitored by the TGA and other organisations. Once legislation is in effect, parents/carers have to provide the kindergarten with an immunisation status certificate. This is a statement showing the vaccines a child has received. 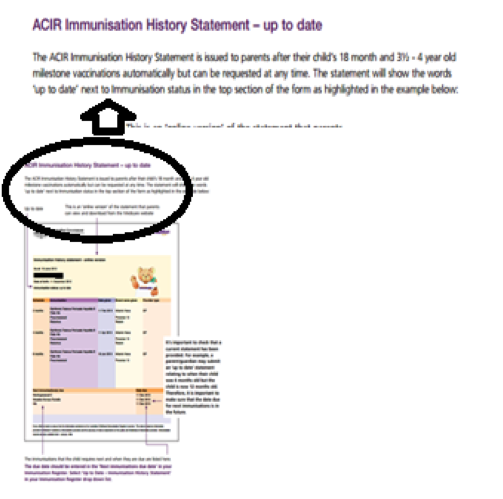 The most common type of immunisation status certificate is an Immunisation History Statement from the Australian Childhood Immunisation Register (ACIR). They can be obtained from Medicare. Some children may be exempt from the requirement to be fully vaccinated on medical grounds. Parents/carers who think their child may require a medical exemption should contact their GP. 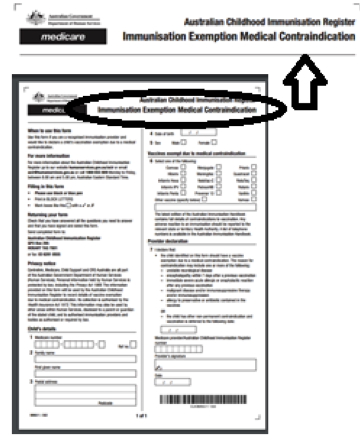 If a child has a medical reason for not being vaccinated, a GP needs to complete and sign a Medical Immunisation Exemption Medical Contraindication Form, and send it to the (ACIR).